Skippering a yacht for the first time can be a daunting yet exhilarating experience. The RYA Day Skipper practical course is designed to teach you to “take charge” safely and confidently. Duration: 5 days or 3 x weekends (weekends do not need to be consecutive). Previous experience required: RYA Essential Navigation & Seamanship or Day Skipper or Coastal Skipper/ Yachtmaster theory course completion (or equivalent knowledge or experience) AND sailing ability to the level of Competent Crew. The RYA recommends that students have the following experience as minimum – 5 days on a yacht, 100 miles experience and 4 hours night watch keeping. Course content: A skipper does much more than navigate and steer. They are responsible for the complete safety and well being of the yacht and crew including weather forecasting, victualling, engine maintenance, sail selection and handling, passage planning, watch keeping, navigation and pilotage. 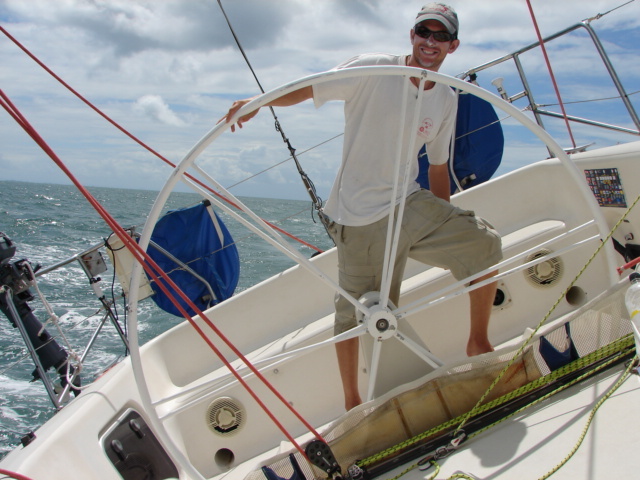 Your experienced and patient instructor will teach you these skills and you will put them into practice as you skipper the yacht on short passages around Moreton Bay. There is particular emphasis on boat handling for Day Skippers and during the course you will practice mooring under various conditions. Students live aboard the yacht during the course and visit many of the beautiful harbours and anchorages that Moreton Bay has to offer to practice pilotage techniques. You will complete at least 4 hours night sailing to experience night pilotage and identify lights. At the end of the course you will be confident to skipper a cruising yacht on short passages by day in sheltered waters. Students who successfully complete the course will be awarded the RYA Day Skipper certificate. Courses are conducted on board one of our comfortable training yachts and the cost of the course includes all meals on board during the course. This certificate is recognised throughout the world and can lead to a professional qualification.